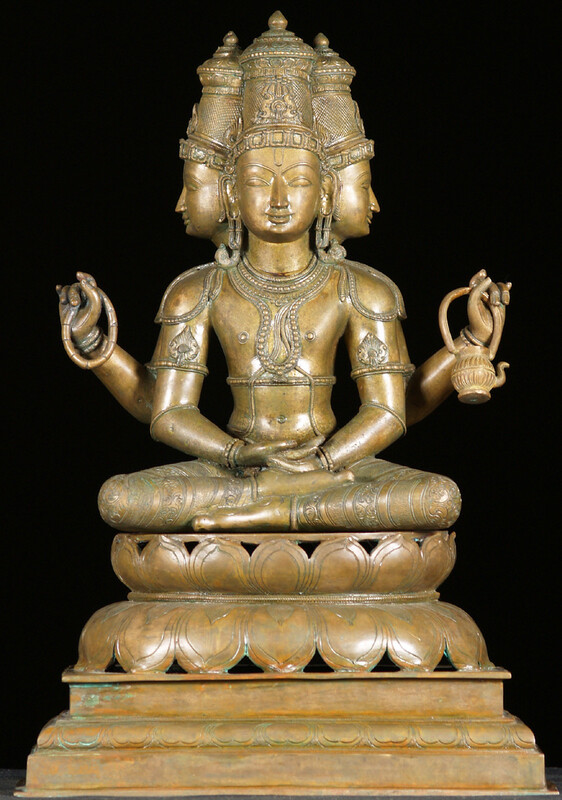 They are the eternal tathāgatas or dhyāni buddhas of tantric Buddhism, or, as they are called most often in the SD, dhyān chohans. Note that the term dhyān chohan is also used in the SD in a broader sense, meaning deva or elemental spirit. 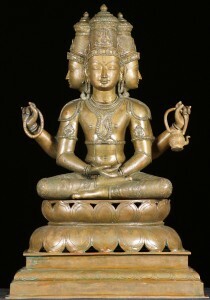 In Buddhism the tathāgatas are eternal and unevolving. In SD I, 88 it is stated that they are latent in pralaya, and active during manvantara. Tetragrammaton, or the Tetractys of the Greeks, is the Second logos, the Demiurgos. The Tetraktys by which the Pythagoreans swore, was not the Tetragrammaton, but on the contrary, the higher or superior Tetraktys. We must conclude that the term tetragrammaton is not used consequently in the SD. Whenever it is used we must ask ourselves whether it refers to the “higher” or the “lower” quaternary. The true Pythagorean Tetraktys was the Tetraktys of the invisible Monad, which produces the first Point, the second and the third and then retires into the darkness and everlasting silence; in other words the Tetraktys is the first Logos. In this case we can see that this passage does not describe the unmanifested logos which we have called the First, but the sacred four, the tetraktys, which manifests itself and retires at the end of the manvantara, which is indeed our Second Logos. In the SD, HPB does not provide an exact mechanism of how the primordial seven are produced from the sacred four. Two different symbolic connections between the four and the seven are given, one of which refers to the 1875 work of J. Ralston Skinner, Key to the Hebrew-Egyptian Mystery in the Source of Measures. 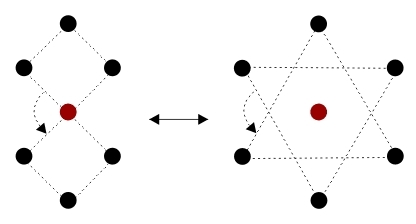 On p. 50 of this work is described that when a cube is folded open, a cross may be formed consisting of one bar of 3 squares and another bar of 4 squares. One square, common to the horizontal and vertical bars, may be counted twice. So we have the cube folded open symbolically representing the equation 6 = 3 + 4. 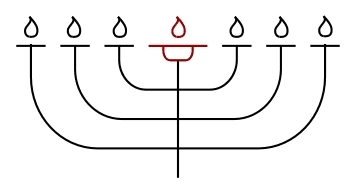 A similar symbolic representation is given on p. 51 of the same work, where the menorah (mənorāh) of the Jewish temple is described as having four arms on each side, the middle arm being in common to both sides, or projected onto itself, so representing the equation 4 + 4 = 7. […] and the tetrad doubled or unfolded makes the hebdomad (the septenary). Here we have the equation 4 x 2 = 7. A representation of this can be seen in the following diagram. We can see that there is an equivalence between the double square and the symbol of the “seal of Solomon”, the centre principle being projected onto itself. […] and the tetrad doubled makes the hebdomad. “and the eight from the twice four” (2 x 4 = 8), instead of “the tetrad doubled makes the hebdomad”. In this edition, the ‘ is missing after the δ.
Plutarch, “De Anim. Procr.” 1027 [sic], says the world consists of a double Quaternary; 4 of the intellectual world, T’Agathon, Nous, Psyche and Hyle; that is Supreme Wisdom of Goodness, Mind, Soul, Matter and four of the Sensible World, forming the Kosmos of Elements, Fire, Air, Earth and Water; pur, aer, gē and πυρ, αῃρ, υδωρ. So the two most significant elements concerning the double quaternary as yet prove to be unfounded: the Pythagorean world being a double Quaternary, and the hebdomad being a tetrad doubled. Returning to the equations, the 6 = 3 + 4, the 4 + 4 = 7 and the 4 x 2 = 7: in this context they all seem to express the same idea, that the primordial seven are “emanated” by the sacred four, so that, on the moment the fourth aspect comes into existence, the three eternals together with the fourth principle become a manifested tetrad, that is the Second Logos. 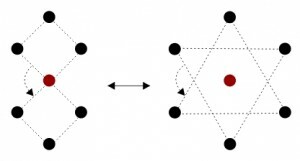 The three are “mirrored” to become a new triad, while the fourth principle is unchanged, or, from a different perspective, the tetrad is mirrored to become a new tetrad, while the fourth principle is “counted double”, or projected onto itself. 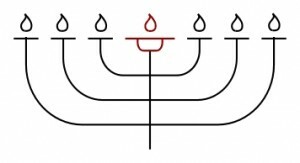 The esoteric Kabalists, however, following the Eastern Occultists, divide the upper Sephirothal triangle from the rest (or Sephira, Chochmah and Binah), which leaves seven Sephiroth. 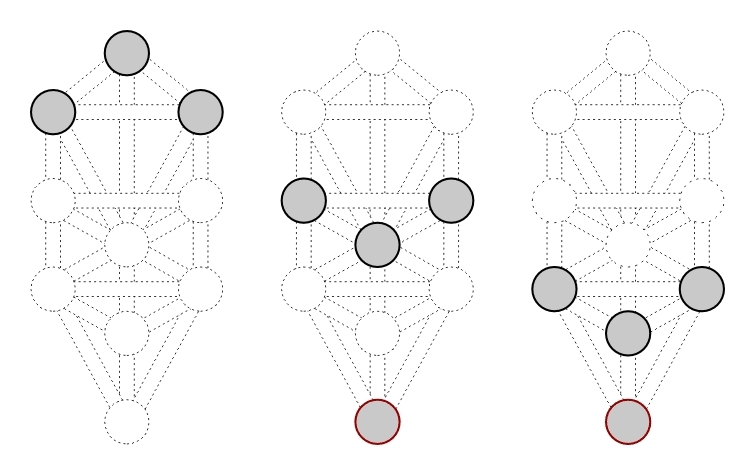 From these two quotes, we may derive that in kabbalistic terms, in the tree of life, the three eternals are the three highest sefiroth (ISO 259: səp̄irōṯ), kĕṯĕr (səp̄irāh), ḥoḵəmāh and bināh. These three are emanated to become three manifested principles, being the three middle sefiroth, ḡəḇurāh, ḥĕsĕd and ṯip̄əʾĕrĕṯ. They are apparently mirrored (or transposed) downward to form the three lower sefiroth, hōd, nĕṣah and iəsōd. The lowest sefirah, maləkuṯ, corresponds to our fourth principle, according to HPB. The “primal centres of Forces” are called atoms, or aṇu in Sanskrit literature. They later become the elements in the sense that the atoms are the bases of the four and seven different types of matter in the universe. They are all meta-physical except the seventh, which is the domain of present-day physics. Its primal centre of force is the ultimate physical atom. “The first after the ‘One’ is divine Fire; the second, Fire and AEther; the third is composed of Fire, AEther and Water; the fourth of Fire, AEther, Water, and Air.”* […] “The ‘First-Born’ are the LIFE, […],”** as said in the Commentary. Sitting in the centre of that plant, from where he did not see the world, his look wandering about the sky, Brahmâ took on four faces, each answering to one of the points of the horizon. […] the four-faced Brahmā, the one who manifests on our plane and who is identical with the tetragrammaton also. Enumerating all concepts (tetrads) we have found to be related, or analogous, to the sacred four, we have: the (higher) tetraktys, the self-existent one, the first four dhyān chohans (four sons, four first-born), the four highest universal principles (7th-4th), the (higher) tetragrammaton (IHVH), Adam Kadmon (heavenly man), the Second Logos, the demiurg, the higher quaternary, the four faces of Brahmā, and the four cardinal directions. Enumerating all the sevenfolds we have found to be related to the sacred four, we have: the primordial seven, the seven dhyān chohans (tathāgatas, dhyāni buddhas, archangels, sons, fighters), seven universal (cosmic) principles, arms of the menorah of the Jewish temple, the double quaternary, the elements, sefiroth, seven primal centres of forces, atoms, aṇu, the seven types of matter in the universe, and the seven planes of the universe. We have not been able to trace here, the individual correspondences for each of these in the SD, but some individual items are listed reliably. In Esoteric Instruction I in CW XII, 658, the universal principles are also listed, as “macrocosmic states of consciousness”, and “elements of manifested macrocosm”. They are added here, in the following table.